In conventional thermoelectric energy conversion, heat is converted into electricity. When a material is placed between a heat source (potentially waste-heat) and a heat sink, a temperature differential exists. This temperature differential drives charge carrier (electrons and holes) movement, which induces an electrical current that could be used as an output voltage. 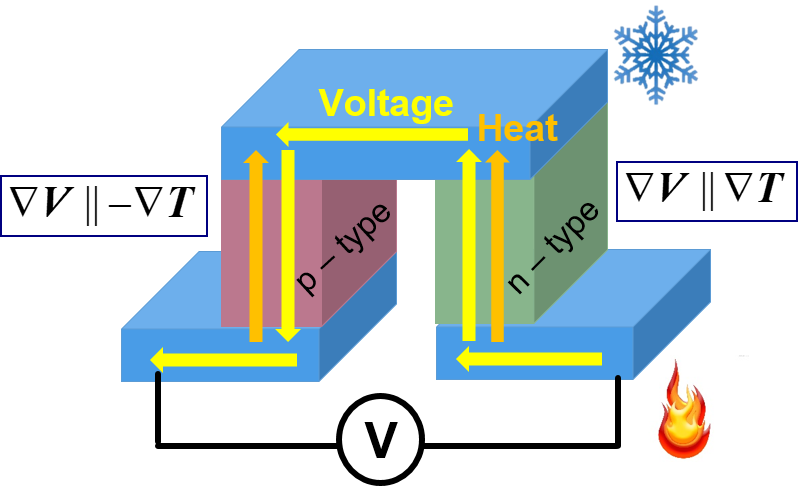 Traditional thermoelectric materials are semiconductors, where n-type and p-type couples are connected electrically in series and thermally in parallel as shown in the figure below. To make a thermoelectric module, multiple thermoelectric couples are connected. Here, the temperature gradient and electrical current run parallel to one another in what is called the longitudinal geometry. Although semiconductors are the most widely used thermoelectric materials, they do have their downfalls – semiconductors are brittle, made of uncommon materials, and typically expensive. Furthermore, output in the longitudinal geometry scales intrinsically with material properties; in order to increase the output of a device, pairs of n-type and p-type thermoelectric materials must be added to the module, creating extra electrical connections and resistive losses. When the temperature gradient and electrical current are geometrically separated, such as in the transverse geometry shown in the figure below, the output actually scales extrinsically with the size of the device (meaning that to grow the output voltage, the material would simply need to be lengthened in that direction). Additionally, the need for both n-type and p-type thermoelectric materials is eliminated since the voltage output can be measured in an isothermal plane due to the orthogonality in the directions of the applied temperature gradient and output voltage. Despite these device advantages, the transverse geometry does need an extra force to push charge carrier movement perpendicular to the temperature gradient, which is found in the Lorentz force. 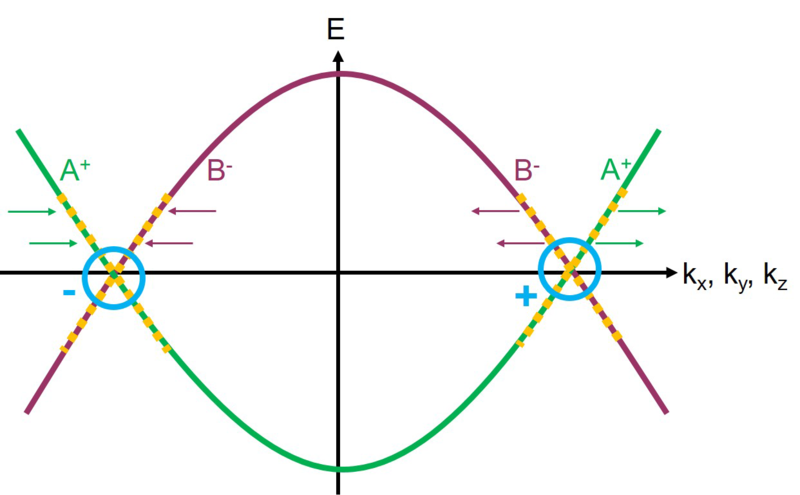 The cross product between an externally applied magnetic field, Happ||z, and a perpendicular temperature gradient results in a force driving electron movement in the third perpendicular direction, resulting in a voltage output mutually orthogonal to both the applied temperature gradient and external magnetic field. In the longitudinal geometry, both holes and electrons move in the same direction (condensing on the cold side). But in the transverse geometry, the magnetic field causes electrons and holes to scatter in opposite directions, where electrons accumulate on one side of the material and holes accumulate on the other. This lends two-carrier systems, such as semimetals, to be strong candidates for thermoelectric transport in this geometry. Weyl semimetals were not experimentally discovered until 2015 in TaAs. This discovery has opened doors for studying unique states of matter in solid-state systems. Weyl semimetals offer unique signatures depicted in the band structure figure below: linear Dirac bands near their crossing points (shown by dashed yellow lines), crossing points called Weyl nodes that always come in pairs due to the breaking of inversion symmetry or time-reversal symmetry (shown inside the blue circles), opposite chirality at the Weyl points (indicated by the blue positive and negative signs), and sources/sinks of Berry curvature at said Weyl points (indicated by the arrows depicting the directionality of the wave function enforced by the conduction and valence bands respectively). Topological semimetals specifically are expected to demonstrate strong thermoelectric transport in the transverse geometry due to the access to both holes and electrons and their ultra-high mobility. Their other unique signatures found in their band structure are also expected to contribute to transport in novel ways. Are all topological materials effective at transverse thermoelectric transport? Can a Berry curvature, or other intrinsic magnetic structure, replace the need for an external magnetic field in a transverse geometry? What and how do other unique transport signatures in topological materials contribute to thermoelectric transport? Can simpler, more consumer-friendly materials be developed to exhibit similar transport signature as topological materials? Can charge transport and thermal transport be independently separated in a way to increase the thermoelectric conversion efficiency of a material?